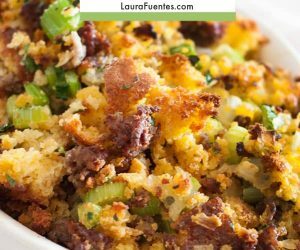 Cornbread and sausage stuffing (or dressing) is a very personal thing, and hands down, the best version I’ve ever had was the one my mother-in-law makes. Her classic southern recipe is the perfect savory sidekick to a well-cooked turkey. What I love about her recipe is that the Italian sausage’s flavors really come through and whether you double this recipe and use some of it to stuff the turkey or serve it on the side as a side, you’ll want to eat a few servings for sure. Making this classic recipe is super simple, just watch how easy it comes together. You’ll find more Thanksgiving recipes on this website here and of course, a complete Thanksgiving Meal Plan. If you are hosting Thanksgiving this year, let me help you walk through what you need to know, step by step! I love hosting and I’ve put together this guide to help you make this year the best Thanksgiving ever! My biggest tip to cut a little prep time on the big day is to make the cornbread a day ahead (or two!). It will not only save you time, but it will toast faster. This dish can also be made ahead of time and only need to be baked or warmed up on Thanksgiving day. What I love about this recipe is that you can make it entirely from scratch or semi-homemade. Whether you make your cornbread with the recipe below, buy the cornbread box mix, or buy it already made, it comes out perfectly moist and crumbly every time. This recipe is that it can easily be made gluten-free by using an all-purpose 1:1 gluten-free baking flour (my favorite one is made by Bob’s Red Mill); however, be careful that not all gluten-free flours work the same so check out the notes in the recipes below for more information. 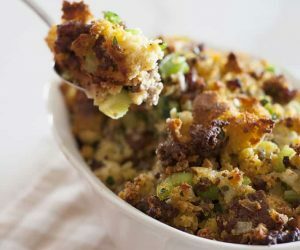 If you are wondering why some people call this recipe “dressing” and others “stuffing” is because while some people use this side dish to “dress” the meal, others use the dressing to stuff the turkey and in that case, it’s called stuffing. Many of us do a combination of both. In both cases, you can use the same recipe just used differently. In this version, I didn’t add any dried fruits or nuts, although some people add 1 cup of chopped chestnuts and even 1/2 cup of dried cranberries. If you choose to do that, you would add them in the bowl, combine them well into the mix and then transfer to the baking dish. This dressing isn’t soggy at all, and unlike stuffing made with dry bread chunks, the consistency of this dressing is uniform throughout. The salty pieces of cooked sausage provide enough flavor to every bite so that it’s a feast for the palate. 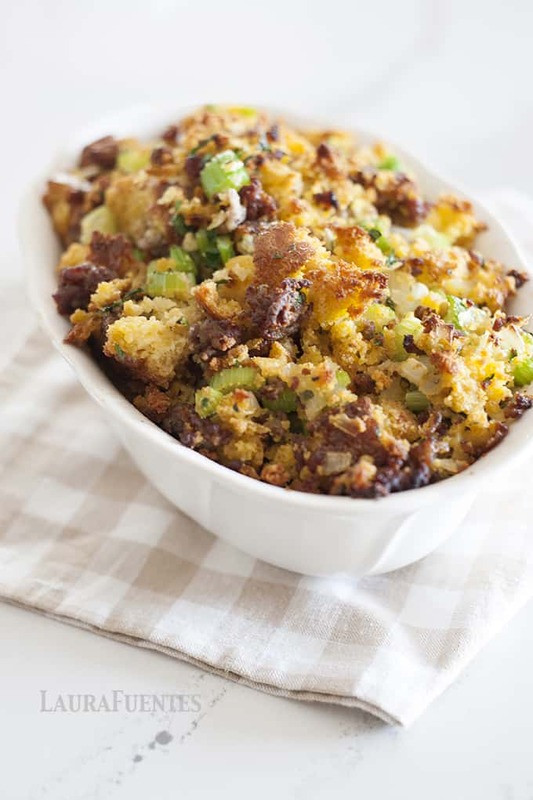 Delicious Thanksgiving side recipe for Cornbread Sausage Stuffing! This can easily be served inside or outside the bird depending on your preference, it’s tasty either way! Preheat oven to 400F and butter or grease a 9×13 baking dish or, a 3-quart dish of any shape. 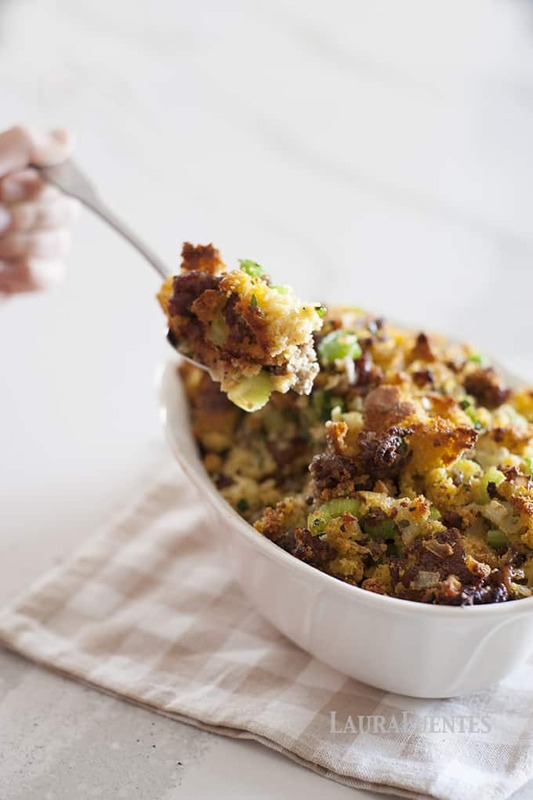 Coarsely crumble the cooled cornbread and place crumbles on a baking sheet. Bake cornbread crumbles for 8-10 minutes, stirring every couple of minutes until crumbles are toasted evenly. Remove from oven and set aside. Reduce oven temperature to 325F and grease or spray a casserole baking dish. In a large skillet over medium-high heat, cook sausage, celery, and chopped onion for 8-10 minutes, until the sausage is thoroughly cooked, making sure to break up the meat into small pieces throughout. Spoon cooked sausage into a large bowl, leaving any oil behind. 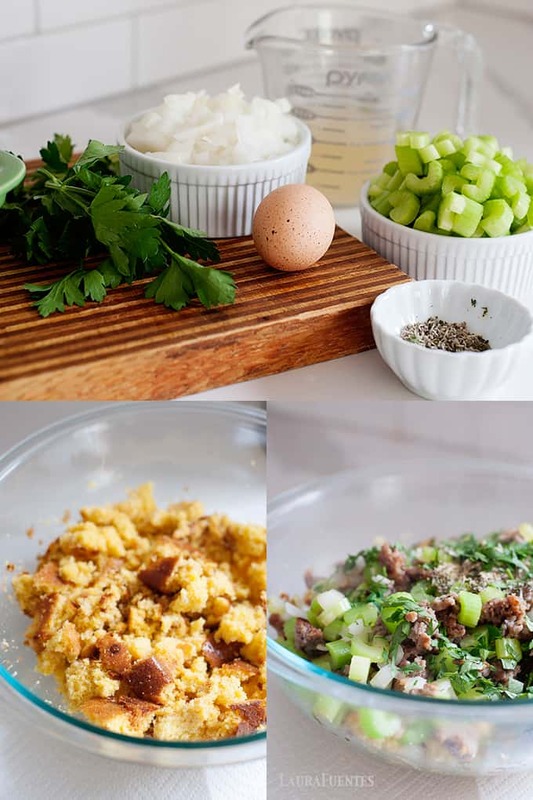 To the large bowl, add crumbled cornbread, finely chopped parsley and seasoning. Toss to combine. Add the chicken broth and beaten egg and combine. Next, spoon cornbread and sausage mixture into the casserole dish and cover. Bake in your preheated oven for about 45 minutes. In the final 10 minutes, remove the cover to brown the top. For the 4 cups crumbled cornbread you can use the recipe below or 1pkg of your favorite cornbread muffin mix according to package directions. 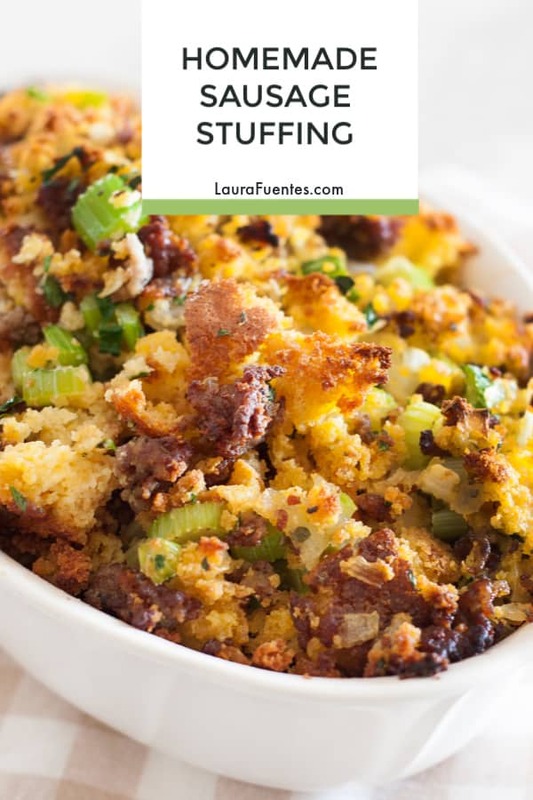 After it has cooled, coarsely crumble it with your hands and place crumbles inside a baking sheet. Toast in a preheated oven for 400F for 8-10 minutes, making sure to stir once until lightly browned. Don’t have poultry seasoning? Add ¼ teaspoon garlic powder, ¼ teaspoon ground thyme, ¼ teaspoon sage, ¼ teaspoon marjoram (substitute cumin if not available). Why reinvent the wheel when Paula’s recipe is hands down the best I’ve ever had. Enjoy! In a separate bowl, mix together the eggs, milk, and butter. Pour the liquid mixture into the cornmeal mixture and fold together until there are no dry spots (the batter will still be lumpy). Pour the batter into the prepared baking dish. For a gluten-free version, I like to use Bob’s Red Mill 1:1 All Purpose Baking Flour. Hi Laura, you mentioned Italian sausage in the beginning of the recipe. The ingredients list is pork sausage. Which one do I use? Either will work. Italian sausage is made with pork sausage (typically). I’ll change it to reflect it. Thank you!